Cloverfield was one of the first horror movies I watched in the cinema and its mysterious marketing campaign made it a thrilling watch. 10 Cloverfield Lane was a better film; tense and brilliantly acted and a great lesson in how to write a low-budget psychological thriller. So, when I learned that The Cloverfield Paradox had just become available on Netflix with little fanfare, it was like Christmas had come early. All I knew was that the film was set in space, and gave a context to the Cloverfield Universe. The Cloverfield Paradox is directed by Julius Onah and stars Gugu Mbatha-Raw as Ava Hamilton, a scientist on board the Cloverfield Station, a space station that contains a particle accelerator that could solve Earth’s energy crisis. After two years of failed experiments, the accelerator overloads and damages the ship. Once the crew have dealt with the most urgent problems they discover that Earth has vanished. To make matters more sinister, they discover an unknown woman trapped inside a wall, fused with the inner wiring of the space station. Events get stranger, and the crew, already fraught with frustration from their failed experiments and the Earth descending into chaos, and the shock and confusion at losing the Earth, begin to turn on each other. Meanwhile, on Earth, Ava’s husband, Michael (Roger Davies), who is a doctor, tries to protect a small child from similarly strange and disastrous events that have occurred since the particle accelerator overloaded. They have also lost contact with Cloverfield Station and cannot locate it at all. The whole film feels very rushed and I wonder if it would have benefited from being a TV series rather than a 100-minute feature. It tries to blend too many genres unsuccessfully and, while interesting, the story doesn’t hold the emotional weight of the two previous films, and a lot of the exposition either gets lost, or poorly explained. There are too many characters for this to work as a feature, again with a series, they would have had time to expand on each character’s motivations. Cloverfield and 10 Cloverfield Lane had small casts, allowing each person to have their personalities explored. Though this was done better in 10 Cloverfield Lane, in both films, you could become invested in the story through the characters. That’s not to say that this film doesn’t try to flesh its characters out, but with the short runtime, there’s just too much exposition and not enough exploration of the characters, making their actions feel meaningless, and, at times, unearned. 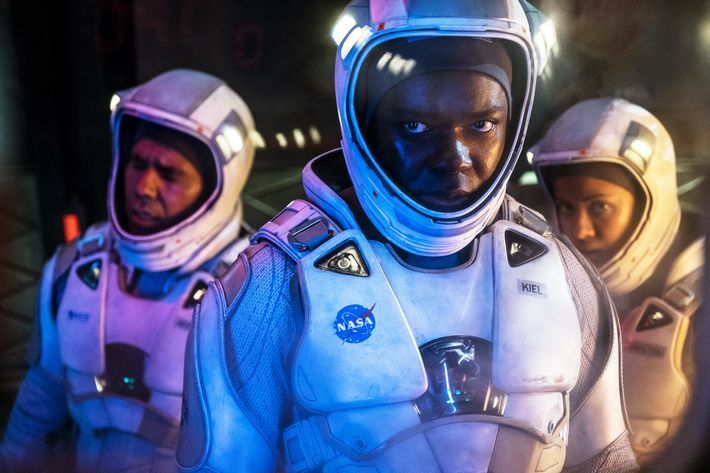 The Cloverfield Paradox has more cliches than The Cabin In The Woods, but is not self-aware and comes across as lazy. My guess is that, the filmmakers had a lot of cool sets and locations, and ideas for shots and CGI to make a slick looking film, but rushed the rest of the production to serve it, rather than trying to tell a story. Final rating: 4/10 Compelling film, but it comes up short enough to be a distinct disappointment. There are three things to talk about here; the plot, the similarity to Event Horizon and the link with the Cloverfield Universe. The plot is derailed by the aforementioned cramming of exposition into the characters, but while all of the performances are good, they feel like they should be in different movies. Ava is similar to Sandra Bullock’s character in Gravity, while Schmidt (Daniel Bruhl) could have been in 2010: The Year We Make Contact, and Mundy (Chris O’Dowd) was along the lines of the Hitchhiker’s Guide to the Galaxy. This serves to make the events of the film feel like they are a series of madcap misadventures, rather than give the creepy tension it is trying to aim for. It transpires that the malfunctioning particle accelerator has sent the space station into an alternate dimension and the mysterious woman is part of the crew in that dimension, while Ava is on Earth with her family, who died in her original dimension. In this reality, the Cloverfield Station has already failed and crashed onto Earth, killing everyone on board, apart from Jensen (Elizabeth Debicki), the mysterious woman, who somehow became fused into the wiring of the other Station. Schmidt, in this reality, was a spy who was sabotaging the particle accelerator to gain an advantage for the German government over the Russians. Volkov (Aksel Hennie) had already foreshadowed the tension between their two countries and accused Schmidt of just that before the malfunction. After the malfunction, he begins noticing things crawling under his skin and it later turns out, after he attempts to murder Schmidt that a tank of worms on the Station for some reason had transported inside him, as well as the gyroscope that allows the crew to navigate. It is never explained why or how this happened. Mundy later gets his arm trapped in the wall they found Jensen behind while trying to fix it. When the crew help him out, his arm has become severed, but apparently like it had been that way since birth. It’s implied that the alternate Mundy had only one arm, but this is never explained. I guess it would be difficult to do so, because you probably wouldn’t send a one-armed astronaut on a mission that the Earth depended on to save them. They later find Mundy’s arm wondering around the Station by itself, independent of Mundy, and it gives them helpful clues. Tam (Zhang Ziyi), unfortunately gets trapped in an airlock that floods with water and breaks the airlock, immediately freezing and killing her. Mundy, having fixed part of the ship, notices a sudden magnetic charge, attracting all metal to it, including the molten metal he just used to patch the ship up. But for some reason, the metal seems to be sentient, and pulls him back to the opposite wall, snaking its way through him, killing him and setting off an explosion. Kiel (David Oyelowo), the captain, sacrifices himself to jettison the damaged parts of the ship after the explosion, leaving Ava in charge. Ava has decided to stay in this reality, as her family are still alive and prepares to board an escape pod with Jensen. But Jensen decides to kill everyone to make sure that the particle accelerator remains in her dimension to be used. Ava stops her and she and a badly wounded Schmidt manage to take their Station home and use the particle accelerator effectively. I’m sorry if that all sounds like a very jumbled description of the plot, but that’s how the events of the film play out. There are no explanations to what is happening, other than they’ve merged with an alternate dimension, which doesn’t explain the sentience of the metal or any of the other bizarre events. In Paul WS Anderson’s cult sci-fi horror, Event Horizon, a machine aboard a spaceship has opened up a portal to what the crew decide is essentially Hell. It is never categorically stated that they have gone to Hell though, and you could decide that they simply stumbled upon a reality with completely different laws of physics to ours, driving people insane. It’s not a water-tight explanation, but with a little suspension of disbelief, you can at least run with it and enjoy a tense bloody horror story with some cool special effects and quirky characters. In the Cloverfield Paradox, there is too much disbelief to suspend because you have to juggle with demons, paranormal events, alternate realities and aliens without any explanation as to why all of these things have converged at once. It should be noted though, that Event Horizon is a film that deserves a decent remake or a tip of the hat, but not done in this ultra-serious fashion. Event Horizon, while not popular with critics, knew it was a campy b-movie horror with a large budget and it works because it doesn’t take itself too seriously. The Cloverfield Paradox’s notes of horror, thriller, espionage, humour, sci-fi, drama, mystery and hard science fiction could have been appropriately and far more deftly explored in a TV series, as I have previously mentioned, but in a feature, just descend into nonsense. So finally, we come to the link with the Cloverfield Universe. One of my few problems with the superlative 10 Cloverfield Lane, was that aliens appeared in the final act and derailed what had been a tight thriller up to that point. It wasn’t completely off-putting, but it was a shame for it to have turned so far left. I understand that, JJ Abrams liked the original screenplay so much that he wrote it into the Cloverfield Universe so that it could gain more publicity and I am grateful that because of that we got to see a good film. But my point still remains that aliens felt a bit shoehorned in, and did not add anything to the plot. I tell you all of this because this movie is less about shoehorning, but trying to ram a square peg into a round hole. We get brief glimpses of monster-like things during the scenes on Earth, but they are manifested as shadows and could have been just bits of debris. But in the last shot of the movie, as the surviving Ava and Schmidt enter Earth’s atmosphere in their escape pod, we see the Cloverfield Monster suddenly pop its head through the clouds and roar. Why? There is no explanation as to why the alien is there. The shot gives context to the other Cloverfield films, implying that the monsters exist because they fell through an alternate dimension, but they obviously did not come from the dimension that the cast of this film went to, so why did they end up on Earth? Also, this film clearly takes place in a dystopian future, while its predecessors take place in modern day, so did the aliens time-travel? If so, why is everyone surprised when they suddenly show up? You’d think people would remember being at war with aliens for the last decade over having an energy shortage. Like I say, it’s a shame that this film is so bad, because it had a great potential – the initial concept of the Earth disappearing, leaving one group of astronauts stranded as the last of humanity that they are aware of, is pretty good. A pastiche of Event Horizon is a good idea as well. But this film was rushed together and fails to make sense, and though it was fun to watch before knowing the plot, it’s frustrating that instead of furthering the lore of the Universe, it just throws many random plot elements at us that don’t really fit. And finally, its initial concept is wasted. The Earth disappearing? Great! The Space Station having moved so that the Earth is now obscured by the sun? Stupid. It was my first thought on watching it, so why did none of the trained scientists on board this Space Station consider at all the very likely possibility that an explosion just threw them through Space a little rather than willing a planet out of existence. The premise, sadly, is an utterly ridiculous mess.